A very easy Monday tangle for you! West Virginia tangler Beth Snoderly’s Slice is a grid-based tangle with an eye-catching simplicity. 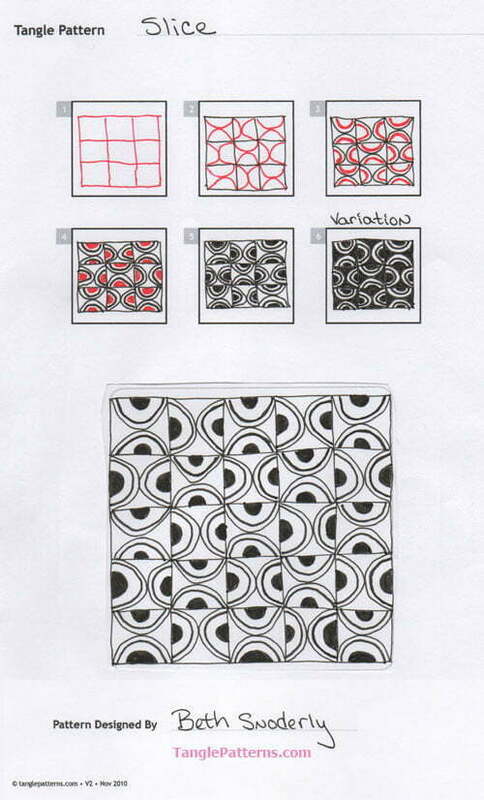 It could be said that Slice is a grid-based variation of the Zentangle®-original classic, Crescent Moon. But it was inspired by pickled eggs! For those of us who are sometimes a little challenged with issues trying to divide spaces evenly with our strokes, I found that if I drew Step 4 before Step 3 I could simply place the remaining stroke half way between the shapes. Beth illustrates the step-by-step instructions for drawing Slice below and shows a potential variation.